And finally, I am proud to introduce you to our star dollie! Meet "Smelly Baby". 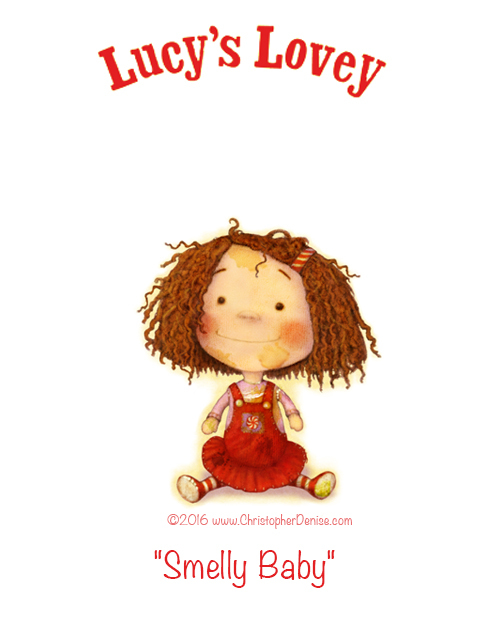 Day 17 in the dollie countdown to the release of Lucy's Lovey by Betsy Devany published by Henry Holt and Co, Christy Ottaviano Books. Lucy's Lovey is available tomorrow (9/27) at your favorite independant bookstore or almost anywhere online! For anyone in Connecticut or Rhode Island, there will be a launch party on Thursday, available 29th at Bank Square Books, 53 West Main Street, Mystic, CT.
"Join us for a launch party for Mystic author Betsy Devany's book Lucy's Lovey from 5 to 7 p.m. on Thursday, September 29, featuring both the author and the book's illustrator, Christopher Denise. This is an open house book signing and launch party for kids and adults of all ages, and we will have crafts, snacks and wine for the adults! Kids are encouraged to bring their favorite lovey to this event"
Hey look-a trailer for Lucy's Lovey!